The old adage is still true: “right plant, right place.” Getting to know the lay of your land will increase chances of planting success. 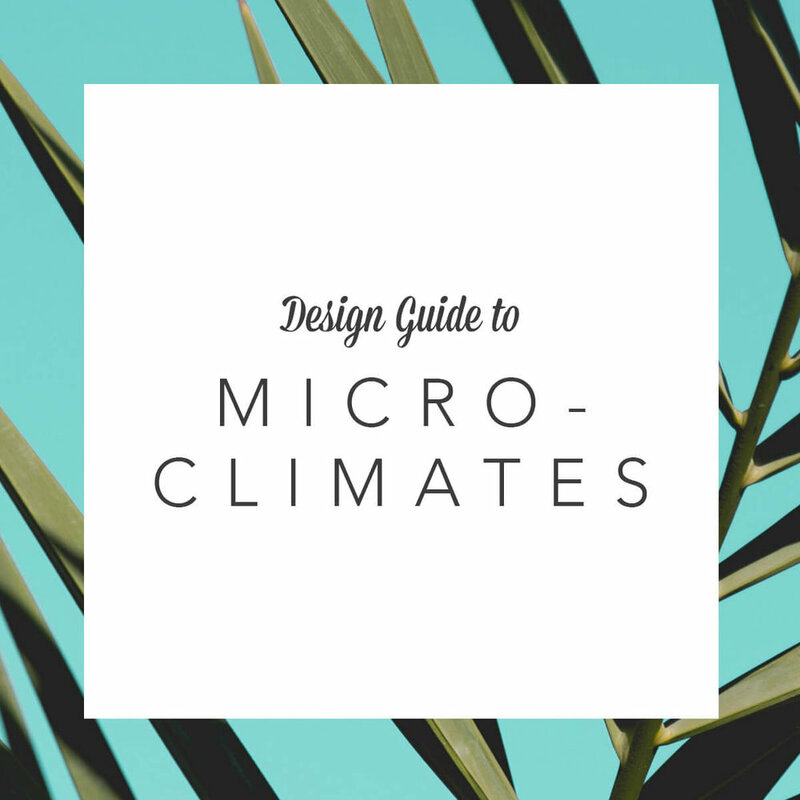 Microclimates are the variations of your climate within a specific area, thanks to hills, structures, or water. This term is loosely applied to areas as small as a garden bed to swaths of land as large as a few miles across. The specifics of your property’s micro climate, or environmental variables, will inform the plants you select and where they best belong. Planting zones identify species best suited to thrive in a given area. You may see “plant hardiness zones,” “growing zones” or “planting zones”—all have been used by growers to gauge which plants are most likely to survive local winters. USDA zones (which cover the entire United States) include 13 tiers of plant/agricultural hardiness. Plant hardiness is a plant’s ability to survive conditions like drought, flooding, cold, and heat. Each zone covers a 10-degree range, with Zone 1 is the coldest, averaging winter temps of -60 fahrenheit, while Zone 13 has a temperate winter hovering around 65 degrees fahrenheit. Sunset Climate Zones take additional factors beyond winter lows into account. These maps gauge a plant’s performance by its performance in the local climate, including growing season, timing and amount of rainfall, winter lows, summer highs, wind, and humidity. Get familiar with how your house is oriented (Google Earth can help here). The amount of sun exposure your property receives will dramatically affect plant happiness, as well as which areas are most comfortable for outdoor activities. Areas with afternoon shade may be optimal for a patio, perfect for dinnertime in August. Areas in full sun may be better suited for a vegetable garden or swimming pool. Keep in mind that paved surfaces and walls will collect and radiate heat. Structures on your property, or on neighboring yards, will cast shadows throughout the day. Wind will also affect your planting layout. Strong winds whipping around corners make sitting areas unpleasant or extinguish your fire pit. On the other hand, strong wind (especially salty, coastal air) can cause growing plants to lean or suffer leaf damage. Strong wind (especially salty, coastal air) can cause plants to lean or suffer leaf damage. Trees, shrubs, fences, and screens can block winds to create sheltered spaces within your yard. If wind direction is a mystery, search online for a “wind rose” from the National Water and Climate Center. The undulations of your land is its topography, which affects how water flows and collects across your yard. Identify high points, which will be drier and warmer, and low points, where water will flow and collect. Water also defines your microclimate by affecting soil drainage, humidity, surface water flows, and exposure to rain, sun or wind. Soils affect the drainage capacity, irrigation needs, and nutrients available to plants. Even on a single property, soil types can vary widely. A quick soil test (bought in garden centers or online) will help you identify factors like pH, soil texture and composition, nutrients, and drainage, which all affect plant success. You may benefit from adding soil amendments prior to planting new garden areas. CLAY SOILS have small, uniform particles that hold little water or air. Because the particles are tightly packed, drainage is very slow. SANDY SOILS have loose, larger particles with lots of air. Sandy soils drain well but lose moisture quickly, causing nutrients to leach through the soil. LOAM SOILS are a well-balanced mixture of clay, silt and sand, causing it to drain well and hold nutrients. Microclimates can be designed, too, by taking advantage of natural elements to increase the diversity of plants grown on your property. A row of trees, for example, will cast shade, hold in heat, or block the wind. Taking all of these features into account when designing a landscape will help to ensure happy, thriving plants. We’re here to help. Reach out at hello@yardkit.com to let us know how it’s going.